Eleven years ago, the glorious leaders of the USA and UK were preparing to invade Iraq. I thought it was a terrible idea, and I marched against the war in Edinburgh. It was the first and only time I joined a mass protest in the streets. 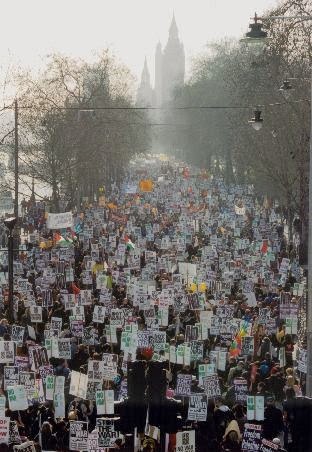 An estimated two million people demonstrated against the war in London on 15 February 2003. This was the largest political demonstration in British history, overwhelmingly made up of ordinary people who did not believe Tony Blair's case for war. Disband. Logical, but hardly attractive. They had harnessed popular anger in a demonstration of unprecedented size. It made sense to carry on and try to make use of this energy. Become a responsible campaign group. Something like the Campaign for Nuclear Disarmament, including a few hippies and weirdos, but with their hearts in the right place. They could try to hold the British government to account for its decisions and prevent future wars. I must admit I have not been watching STWC's activities very closely. But sometime in the last eleven years, they chose option (3). The February 15, 2003 anti-war march in London. It makes sense for an anti-war campaign group to issue a statement on Ukraine. Are they calling on all sides to resolve their differences peacefully? Not so much. The British and US governments are placing the blame for any escalation on Russia, which has sent troops into Crimea. We oppose all foreign military intervention. Not exactly a ringing condemnation of Russia. You know, the country which sent soldiers to occupy the territory of Ukraine, blockaded Ukrainian ports and military bases, and has another 100,000 soldiers conducting "exercises" just over the border. So Russia, with one of the world's largest armies and 3200 nuclear weapons, led by a President responsible for war crimes in Chechnya and countless other abuses, was forced to send troops into Crimea because the West has been very, very bad for the last 15 years or so. Because the democratically elected governments of places like Poland and Estonia have chosen to join NATO. Because the USA and its allies invaded Afghanistan with President Putin's support in the UN Security Council. Because the USA and UK talked about air strikes on Syria, and then decided not to do them. In what universe does that make logical sense? It doesn't even rise to the level of being wrong. I'm not saying the West has entirely clean hands. It appears there are thugs and gangsters on both sides in the Ukrainian conflict. If our governments have been backing "their" gangsters to try and defeat the Russian ones, it certainly wouldn't be the first time. STWC's statement complains about the "major role" the USA and EU played in Ukraine's change of government, and their alleged responsibility for "far right and fascist elements" in the new regime. There may well be a case for Western governments to answer, but STWC are incapable of making it. They have lost all credibility with their wild accusations and irrelevant asides. It would seem that STWC are unhappy with the British government's approach to Ukraine. What do they suggest we, as citizens of the UK, should do? What action do they demand from Parliament? They don't say. The statement trails off into vague grumbling about a "new Cold War" and how very bad it is. In fact, Western politicians are making it very clear they will not take military action against Russia. That applies even to the most bellicose, such as John "Bomb, Bomb Iran" McCain. One might expect an anti-war organisation to welcome this news, but STWC do not see fit to mention it. US secretary of state John Kerry has made strong statements condemning Russia, and British prime minister David Cameron has argued against intervention and for national sovereignty. No one should take lessons from people who invaded Afghanistan and Iraq and bombed Libya. According to STWC, no one should listen to the governments of the USA and UK on any subject, ever. Anything they say must be wrong. Any implied logical contradictions can be resolved by pretending they don't exist. It is hard to imagine a more childish attitude. If I were of a paranoid frame of mind, I might think STWC had been infiltrated by MI5 to discredit anti-war activism; but I suspect they have achieved this level of stupidity by themselves. It's easy to point out how ridiculous STWC's posturing is. It's an embarrassment to all of us who marched against the Iraq war. One can react with laughter or rage, and I'm trying to go with laughter. But seeing how far STWC have fallen is sad too. Their incoherent fury is stupid, but in a way it's understandable. In 2003, two million British people marched against a massively unpopular war. A Labour government, with the full backing of the Conservative party, ignored them and went to war anyway. Eleven years on, Tony Blair jets around the world making vast sums of money and pretending to be relevant as a Middle East peace envoy. Underlying STWC's anger at the UK government, I think there is a strong element of despair. Why bother to call for action, when public protest achieves so little? The world moves on, and our political classes hopefully have learnt a tiny bit from the mistakes of their predecessors. It's encouraging that the USA and UK decided not to launch yet another war against Syria. But the Iraq war casts a long shadow. One of its minor consequences is a British anti-war movement which has completely taken leave of its senses.